We created a trail of five, two metre high, carved oak way-markers sited at intervals on the footpaths throughout the woods, with an extra explanatory post. During research for the project we noticed the numbers of green parakeets in the woodland. In the local library we discovered that it was once a fruit growing area, so the crow is shown eating a pear and the butterfly farm gave us the subject for some of the carvings. 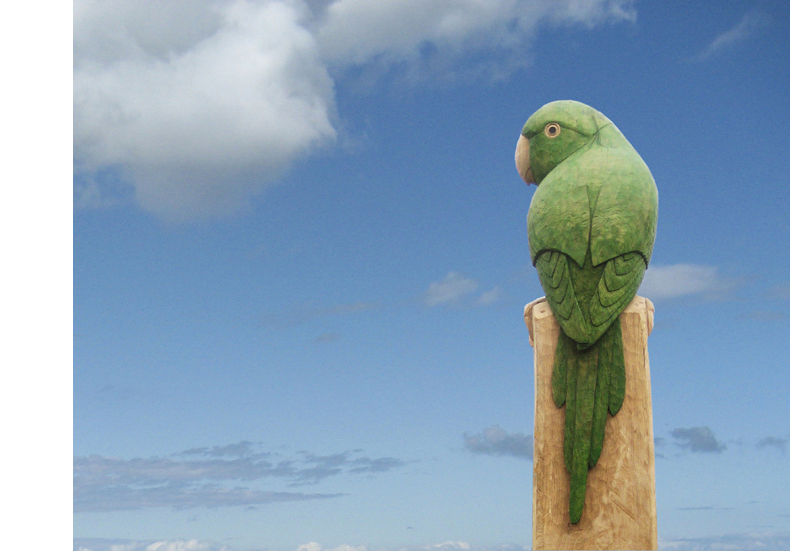 Phil designed the Parakeet first, which helped to show the format of the sculptures. The wooodland animal subjects were then chosen by pupils from Bursted Woods School and local people - for the remaining four posts. All the additional creatures carved in relief on the posts are there in different numbers, helping the children with counting games. The arrow and brief words carved on the posts are clues to the next post. The Parakeet is close to an open grassed area, and is for children to use as their ‘home base’ in games of tag. Jazz Cousins helped carve some of the insects and Jem Waygood assisted with fitting the fixings.